The last few days I’ve been on a business trip on Washington DC. Once I got to DC I was summoned back to a client meeting in New York for one day, and then I had to take the train back to DC that same day. After my meeting was done, I took a bike from 56th and 6th…a man was returning his bike and this woman literally ran past me and grabbed it. if there weren’t three other bikes I’d have been a little pissed. Amazing how Citi Bike’s deficiencies are inadvertently doing some social engineering for the worse–they’re creating a subculture of really, really rude people. But I had a remarkably good ride home, at right at the peak of rush hour, going crossdown on 56th and the downtown on 9th. I made it to Penn Station in plenty of time to catch the train back to DC. 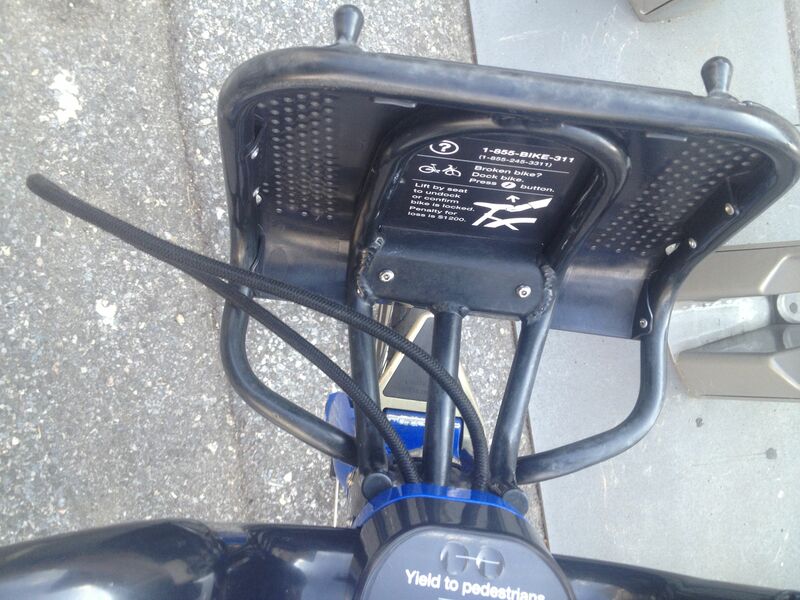 In DC I got to see “Capital Bike Share”. It was like looking at a bizarro version of Citi Bike–because Alta makes the bikes, the docks and bikes are exactly the same as in New York, the only difference being that they’re bright red instead of bright blue. 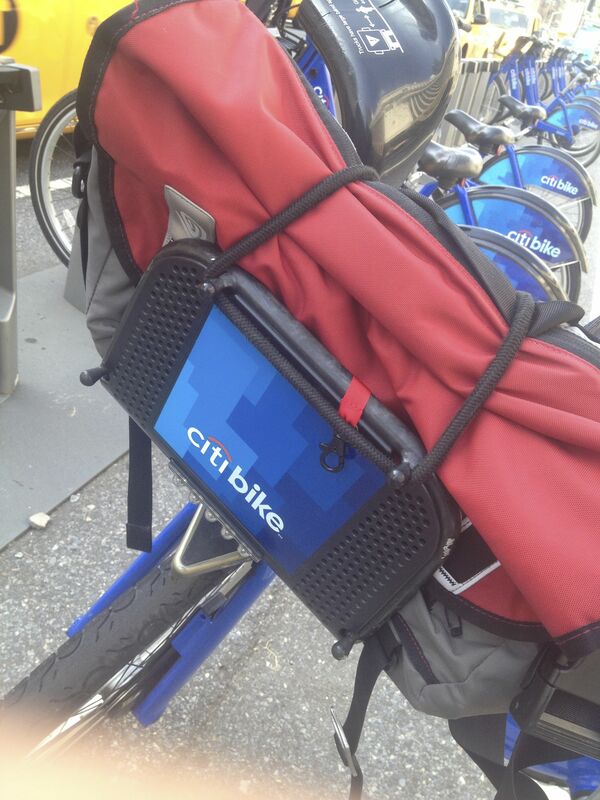 I contemplated whether I should take Citi Bike around–after all, one taxi ride from Union Station to my hotel was about $8, while a three day pass for unlimited use of Capital Bikeshare was only $15. I did the math and assuming I averaged two rides a day, that’d end up costing me (or rather, the client) about $2.50 a ride. Not bad. That is, until I compared the price to the DC Metro. To get to my client’s location was only $2.15 a ride, $1.75 if not during rush hour. Now it’s been years since I’ve ridden the DC Metro, but I was shocked, absolutely shocked, at how much better it is than the MTA in New York. The seats are padded, and most of the time you can not just get a seat, but get one to yourself. There’s not the unmistakable smell of urine everywhere. All the stations all tell you exactly what time the trains are arriving. The trains are quiet. You can get a cell signal at all the stations, and even during many of the rides. Even late at night the stations are well lit and filled with people so you feel safe (unless you’re Zoe Barnes). Their version of the Metrocard, the SmarTrip card, works by “tapping” vs. swiping, whether you’re entering and exiting the station or refilling your card. The new Silver Line just launched (I have the commemorative SmarTrip Card to prove it) and the cars are clean, quiet, and simply a joy to ride. And to get from Union Station to my hotel cost about $7 less and took about 5 minutes quicker than taking a taxi. I’ve been on a lot of subway systems these past few months. Taiwan gets an A+. Japan gets an A. DC gets a B+. New York gets an F—————-. Back in 1914 it was the bee’s knees, but 100 years later it’s like the third world of subway systems. And ironically, the MTA is collecting a maddening $2.50 a ride and always talking about jacking it up. I would have had to bike four blocks for the chance of finding an empty rack, so the bulk of the week was taking the Metro. 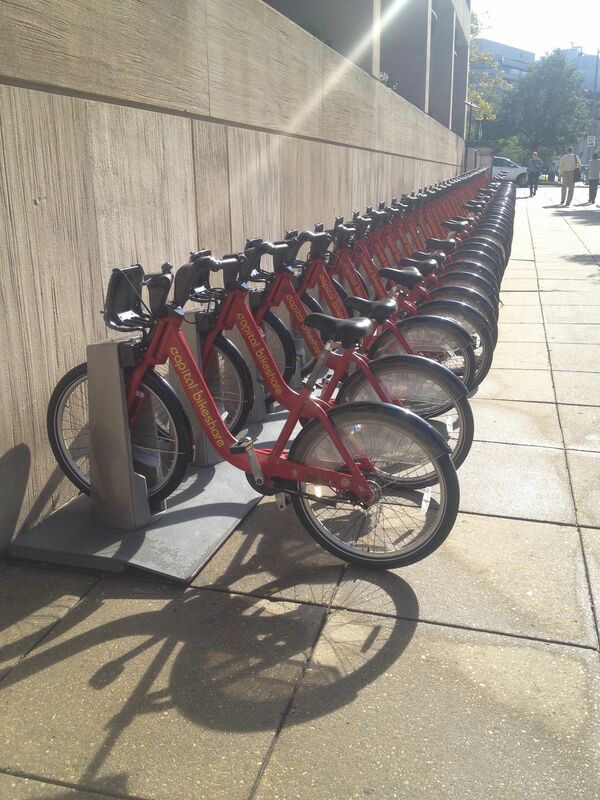 But I finally got to try out Capital Bikeshare for myself a few days later. It’s been a while since I posted an update, and that’s mainly because it’s been a while since I rode a Citi Bike. I had a pretty uneventful ride to work on August 11, up Eighth, cross 40th, and up Madison. No complaints for once. Then, it was off for vacation, so no biking for me. I returned to work on Friday the 22nd of August. I took the subway to work that morning, but decided to try an experiment riding home–I had a couple errands to run and wanted to bike to the Sony Store on 55th and Madison, then bike down to the Best Buy on 5th and 44th, then bike to Times Square, and finally bike to Macy’s. Since I had summer Fridays, I got out of the office at 3 PM. 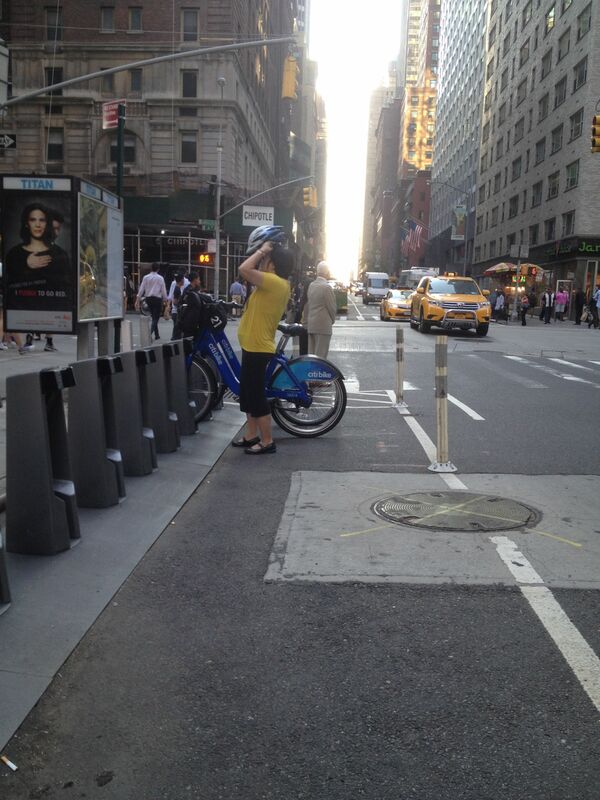 I figured, there’d be plenty of bikes available on 53rd and Madison, but there was only one lonely bike. I grabbed it and biked up to the Sony Store. Plenty of bikes outside the Sony Store, so I picked one up and biked down 5th to 44th and docked my bike there. 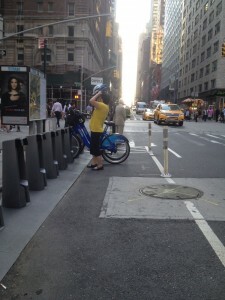 I ran into the Best Buy and ran out and–you guessed it–by 3:30 ALL the bikes at the 44th and 5th station were gone. And so I had to walk the rest of the way. Yet another sad story of Citi Bike not being there when I needed it. I’ll count this as a half-ride because I only got halfway to my destination. So my experiment failed–unless you’re sticking to only barren parts of the City, forget about using Citi Bike as a quick way to run errands. 1) There are no bike rebalancers. 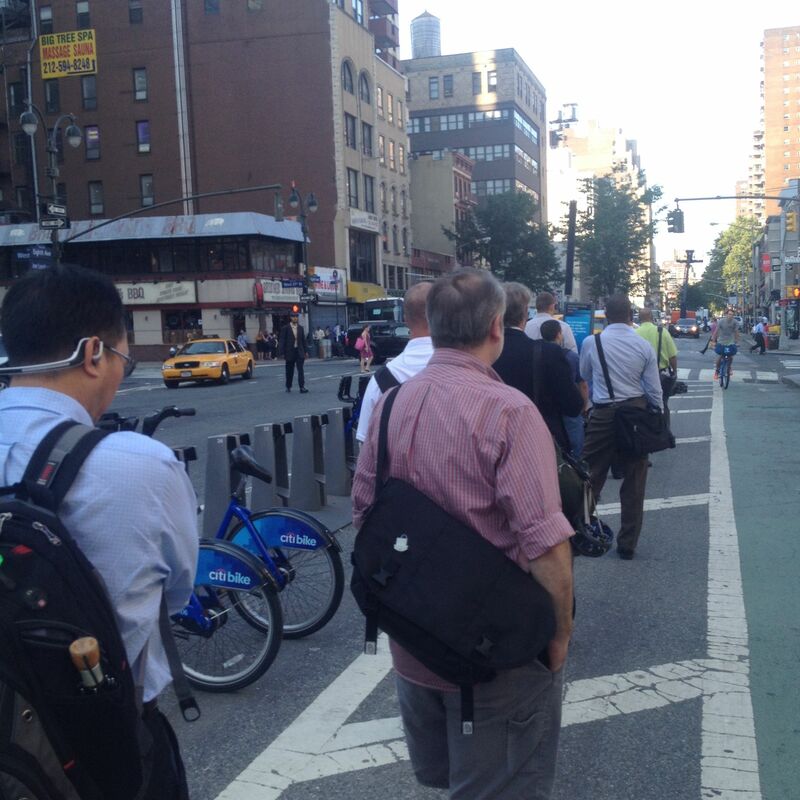 Now granted, I know the rebalancers work really hard and do a great job, but Citi Bike needs many more of them. There’s no reason those docks should not be full of bikes for people to take. How ridiculous is it to wait on line for 20 minutes when I can walk or take the subway and be at the office in that time? 2) There were plenty of bikes in the docks, but they all had their seats turned down, indicating they were broken. So why hasn’t someone taken them are repaired them? 3) There is plenty of room for more docks. Who’s the bright mind in Central Planning that decided to put so few bike stations all around Penn Station? And when they double the number of bikes shortly, are they going to have the same paltry amount of bike spaces around one of the busiest transportation hubs in the city? Funny thing (for me, not for the people on line) is that right after I took this picture I turned around and walked to the other side of the dock, where right as I passed by the front someone rode his bike up and docked it. There was no one around me, so I just nonchalantly grabbed it. I guess the race is not to the swift nor the battle to the strong, but time and chance happen to all. Although this was like winning the lottery–more often than not if I come in on the 7:47 train, I’m going to be waiting on line. I rode to 44th and 5th where I wanted to stop by the Best Buy, but ironically biking was so efficient I got there at 8:30 and realized they didn’t open until 9:00. Alas, I walked the rest of the way to the office. Pretty uneventful two rides today. I got in on the late train and there were plenty of bikes waiting for me on Eighth. I had my computer bag (a lovely Timbuk2 TSA-Friendly Laptop Bag that my wife and brother-in-law got for me, which is my favorite laptop bag of all time, especially in airports) with me. Inside I had my precious MacBook Pro, as well as some fruit from home. Citi Bike’s area in front for storage is one of many Citi Bike features that has gotten a lot of flak but I haven’t had too many problems with it. Granted the first time I tried using it I had a small plastic grocery bag, which flew off the second I crossed the intersection at 34th.But I’ve since learned for plastic grocery bags to either put them inside a larger bag OR tie the plastic handle to the metal frame in the bike. I do like the fact that the carrier is in the front vs on the side where you wouldn’t see if it flew off, and the way they have it today is a lot less goofy looking than having a big wicker basket like on a girl’s bike. Sure, they could do a better job of engineering it, but like I said it’s worked okay for me so far. To use the basket, you need to put your briefcase, purse, or bag in the front–and make sure you leave anything you wouldn’t want to get crushed at home–this is not the thing for transporting Faberge eggs or Tiffany lamps. Then, you take the thick elastic cord and wrap it around the front of the bike. There are four “notches” on the placard in front. If you have a large thing to carry, you hook the elastic loop onto the top two notches. If you have something smaller, you’ll need to use your strength but you can hook the elastic onto the bottom notches. The key here is the make sure that your bag is snug and that the elastic is gripping it tight. I usually test it out by slapping my bag a few times. I rode up Eighth to 40th and cut across–traffic was lighter than usual but I did have the tight squeeze before Bryant Park to contend with. I made my way to Madison to the bike station at 53rd and Madison which–surprise–had no open docks. So I backtracked to 47th and Park. I actually took a midday ride as well. I needed to go to run some errands at CVS and the Sony Store a few blocks from the office, so I took an afternoon walk. At the Sony Story, I saw a row of stations outsdie and figured, what the heck. So I took a Citi Bike and rode the 5 blocks and 1 avenue from 56th and Madison to 51st and Lex. Granted, walking would have taken me about 8 minutes, while biking took me about 5 minutes, so I saved a whopping 3 minutes. But the ride that time of day was pleasant and the roads pretty clear, so I figured I’d enjoy my membership.